Demonstrators throw wood onto burning tires at a barricade during a protest as Honduran President Juan Orlando Hernandez is sworn in for a new term in Tegucigalpa, Honduras, Jan. 27, 2018. The United States' top diplomat and a global human rights group called on the Honduran government Monday to hold members of its security forces responsible for alleged abuses after November's elections. 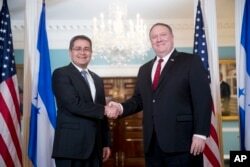 State Department spokeswoman Heather Nauert said Secretary of State Mike Pompeo discussed with Honduran President Juan Orlando Hernandez the need to pursue those responsible. Hernandez, who was re-elected to a second term in elections that opponents called fraudulent, visited Pompeo in Washington. That meeting followed Amnesty International's release of a report on the post-election protests. Secretary of State Mike Pompeo, right, shakes hands with Honduran President Juan Orlando Hernandez, left, at the State Department in Washington, June 18, 2018. Amnesty said 118 people face charges related to the protests, but no member of the security forces has been charged in any of the 32 deaths. "The security forces employed excessive force to repress peaceful demonstrators, they were locked up in deplorable conditions for months and denied their right to due process and adequate defense," said Erika Guevara Rosas, Amnesty International's Americas director. She said that by imposing harsh sentences on those arrested the government is trying to intimidate them against exercising their right to freedom of expression. The wait for election results dragged on for weeks due to irregularities, but the controversy began before votes were cast when Honduras' top court overturned a constitutional ban on re-election to allow Hernandez to run. "There are no investigations into the deaths nor charges against the law enforcement officers," the report said. Nauert said Hernandez and Pompeo also discussed combating corruption and drug trafficking and discouraging illegal migration.